I have always been a huge fan of a toppings bar for several reasons. I’ve noticed my kids tend to eat more of whatever I’m serving when they can control what goes on their plate. I also think it’s so much more fun when your guests can participate in and interact over the meal. 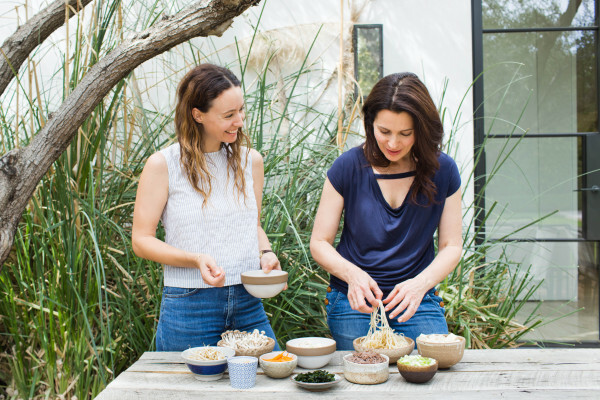 Lastly, preparing a topping bar ahead of time allows the cook (me and you) to be free and enjoy themselves rather than worrying about timing everything perfectly and accommodating everyone’s different dietary restrictions. I have shown on this site topping bars for everything from oatmeal to baked potatoes, from salads to tacos. Jenni Kayne was telling me one day about her ski trip and how much she loved the soup bar at the ski lodge for lunch. Let’s do a Miso Soup Bar post! Great idea! Today’s post is also up on her fantastic blog Rip + Tan, too. We shot this at Jenni’s amazing house after a class one day. Of course she had a few dozen perfect bowls to use for all the ingredients! Miso soup is so healing, really easy to make and my whole family loves it. 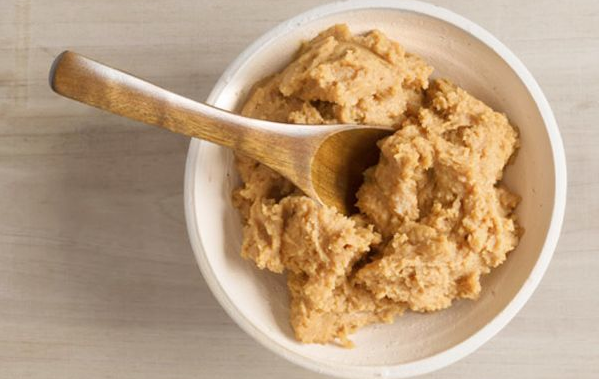 Miso paste has a rich, savory, umami-like quality about it. But I am pretty particular about what kind of miso to buy, so please read my tips. · Miso is fermented so therefore it contains healthy bacteria which helps our digestive system and immune system. · It is a complete protein and contains all of the essential amino acids. · Miso is alkalizing to our cells and tissues. · It contains linoleic acid, a fatty acid that helps you maintain beautiful healthy skin. 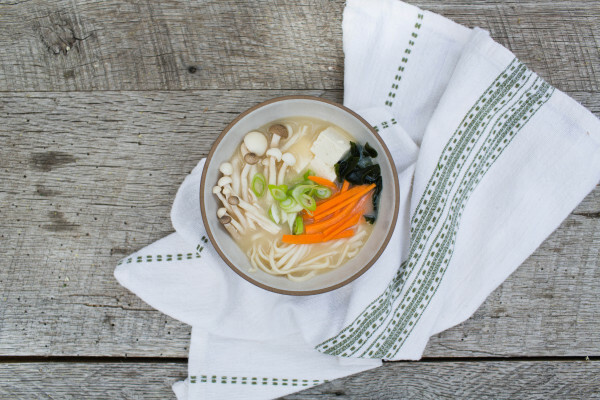 · The isoflavones in miso can help regulate hormones. 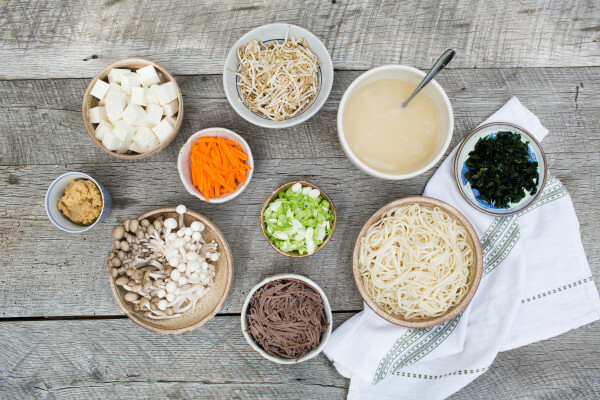 · The sodium in miso does not have a negative affect on the cardiovascular system like table salt does. · There is an acid present in miso called zybicolin that helps detoxify the body and eliminate elements taken in through pollution, radioactivity, and artificial chemicals in our soil and foods. 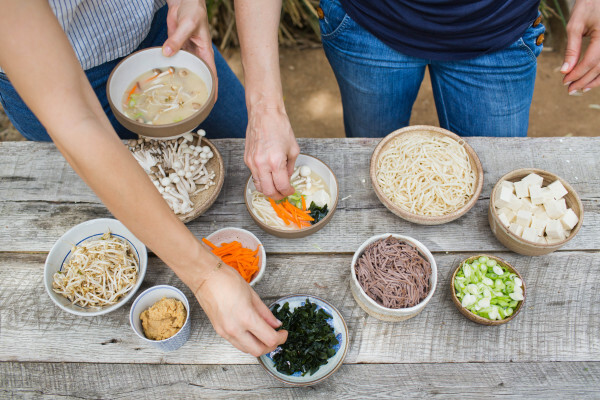 · Miso is a good source of the B12 vitamin, which is a B vitamin most commonly found in fish and land animals, so important for vegetarians and vegans. Buy organic or at least non-GMO (genetically-modified organism) since the main ingredient is soybeans which are almost always GMO, unless certified organic. Buy miso that is naturally fermented (look on the label to make sure there is a bacteria, on the list of ingredients). Fermented soy is much easier to digest then non-fermented and fermented foods, in general, increase the concentration of beneficial bacteria in the digestive tract. Probiotic organisms aid in digestion, and also play an important role in maintaining and strengthening the immune system. Buy unpasteurized miso, so it’s live. Store in your fridge for months, even a year and a half! Boil miso- it will destroy the live enzymes. Always add miso at the last minute, off the heat. Assume miso is gluten free- it often can contain barley and/or other gluten grains. Check ingredients. Buy miso outside the refrigerated case at the supermarket. It won’t be live. Unpastuerized, and therefore refrigerated, miso contains live good bacteria, which help your body assimilate nutrients from food. Different types of miso: The different colors of miso are related to how long the miso was fermented and the composition of ingredients (usually rice or barley). White miso is fermented for the shortest period of time and has the lightest/sweetest flavor, followed by yellow, and then red. Brown miso has fermented for the longest period of time and has the strongest/saltiest flavor. Other great ideas for toppings include, but aren’t limited to, soft-boiled eggs, cooked shrimp or pork, shelled edamame, cabbage, spinach, bok choy. Have fun! Make the dashi (broth): In a medium saucepan over medium-high heat, bring the water and kombu to a boil. Remove the pan from heat and add the bonito flakes. Cover the pan and allow to steep for 5 minutes. Strain stock through a fine mesh sieve or a cheesecloth-lined colander into a large bowl or another saucepan. If you are not using the stock immediately, allow to cool uncovered and then refrigerate it, covered for up to a week. Transfer all but ½ cup of stock back to the original saucepan and heat until hot. Whisk miso into the reserved ½ cup of stock until smooth. If you think you will consume all of the soup now, stir all of the miso mixture to the heated stock and serve immediately. Otherwise, add a spoonful of the miso mixture to each individual bowl and ladle hot stock on top. Add desired toppings. It looks so beautiful and yummy! Come to my house and make it for me!Please! Will I have to spend a fortune buying all the things to get started? My fridge has too many bottles of things in it already! But I love that I can control the salt. I was out with a group and in an effort not to have carbs or processed meat, I tried this Miso soup at Panera Bread and it was very good but very salty. Not at all! Miso is not expensive and lasts a while in the fridge. And bonito and seaweed are also not pricey and last forever in the pantry. Beyond that, you can add in what you wish or nothing at all!